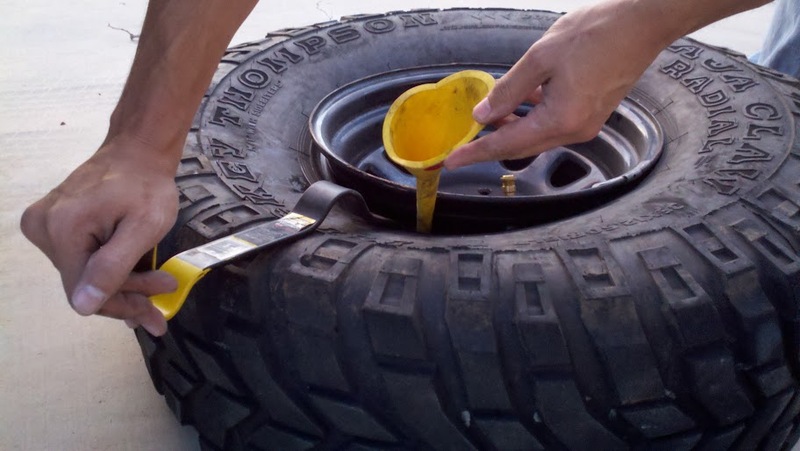 One of the things I've wanted to try for awhile was balancing my tires using Air Soft pellets. It seems like I am always throwing the metal cramp on weights that discount puts on and constantly needing the tires re-balanced. To start out I looked at this dyna bead chart to get an idea of how many ounces I would need for each tire. I headed over to Amazon and put in an order for 2 packages of pellets. I used the TSD competition grade pellets just because they were a little cheaper. 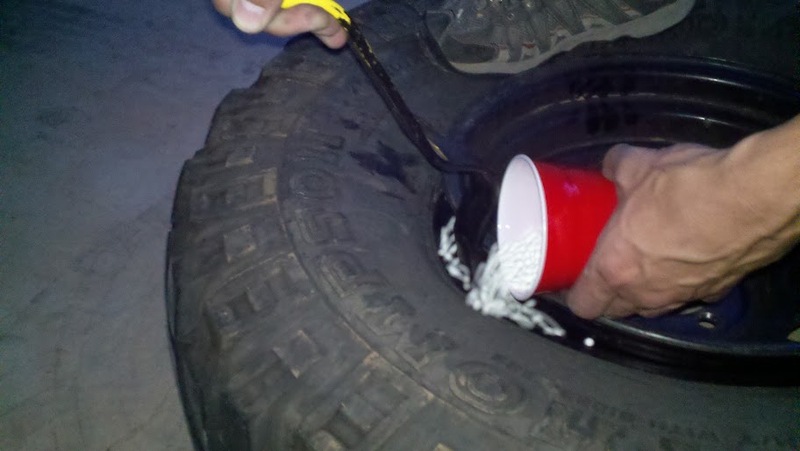 The next step was to break the bead on the tire. 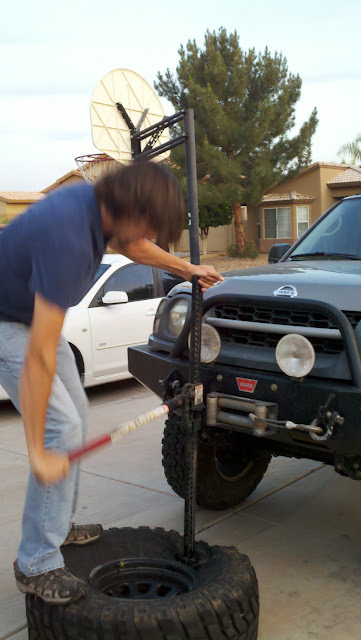 Mike came over and we decided wed find another use for the hi lift and use the downward force of it to pop the bead. Once the bead was off we had the idea to use a funnel to guide the pellets in. Again this didn't really work that well. Its much easier to just dump them in with the cup. Once the beads are in its time to play with fire and re-seat the bead. At first we tried using lighter fluid. The flame didnt burn hot or quick enough to get the bead back on. But it stills fun lighting things on fire. 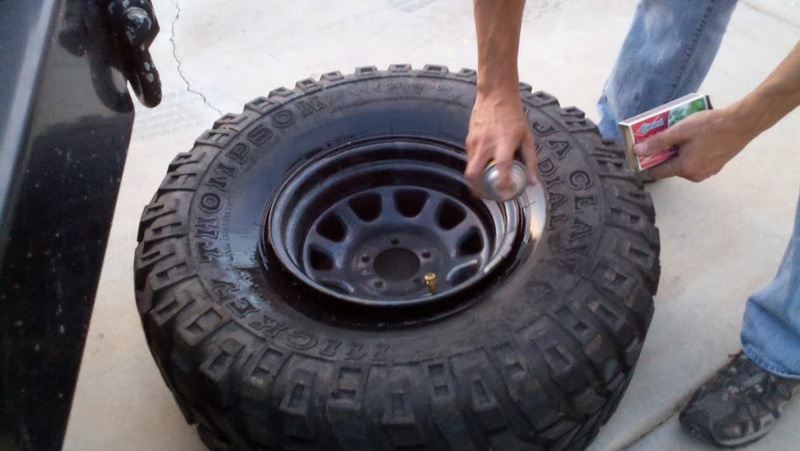 Next we did it the correct way and sprayed starting fluid around the rim. Once the beads on the last step is airing them up and bolting them back on. I noticed a difference in balancing compared with the metal weights. It seems to do better and I don't have any wobble in them anymore. They do make a little noise when stopping but its nothing distracting or annoying. Setting the bead with FIRE! Last edited by Skatchkins; 06-20-2011 at 10:10 PM. Great job, Chris. 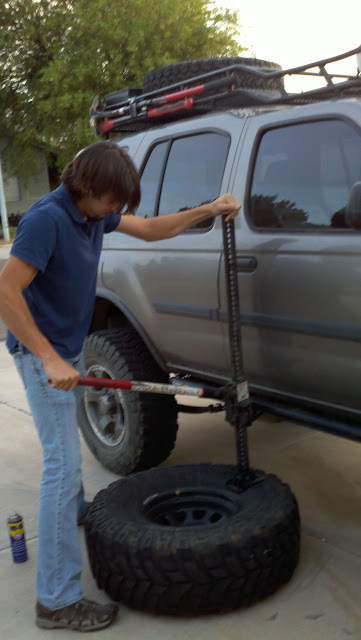 I'm running bead in my TJ (especially due to the bead locks) and they work great for me. I can tell a difference between having them and not. The Ounce Chart is very helpful. I just always put in 1 cup for my 40's, 3/4 a cup for my 35's, but it's nice to have science now. Last edited by alanzona; 05-16-2011 at 11:12 AM. Did you take the wheel weight off? Way too much starter fluid. Get the air compressor out and hook it to the valve stem while pumping air. 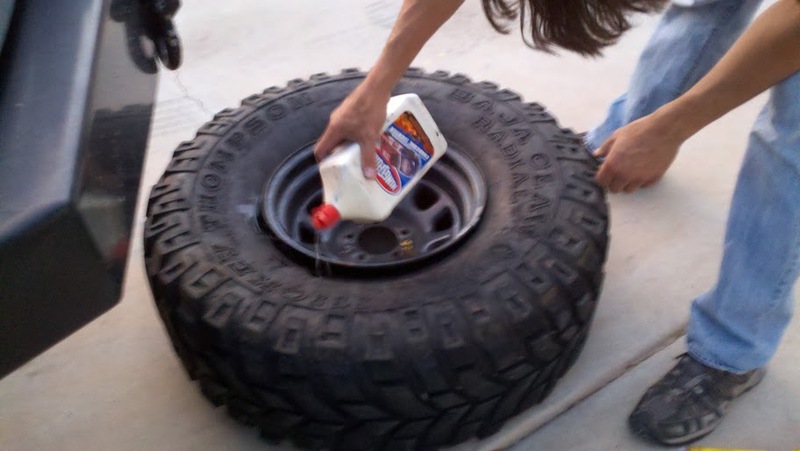 Then, run one quick ring of starter fluid around the rim and light. Looks like you did 2+ passes. Plus it was having trouble coming out of the can at that angle. Last edited by Skatchkins; 05-16-2011 at 09:53 PM. 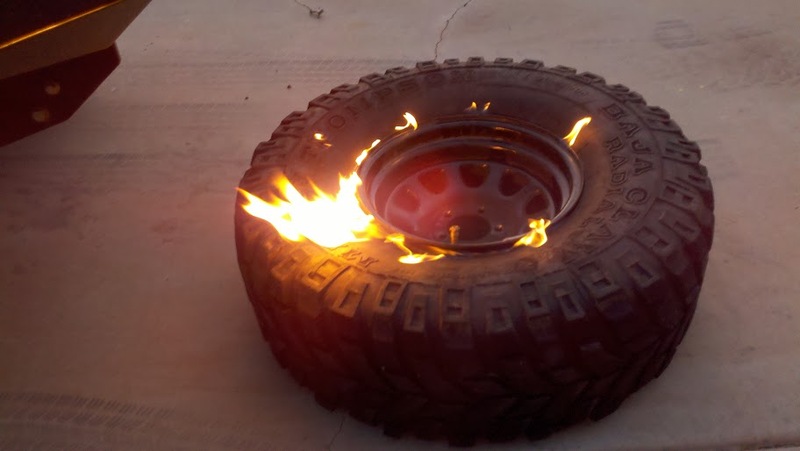 When the tire explodes, tears your arms and legs off, and sends them flying across town in giant fireballs, then you have too much fire. For a technical write up, I agree with Virgil. For just plain 'ol personal fun, I too subscribe to the "there is never too much fire" school of thought. 1. 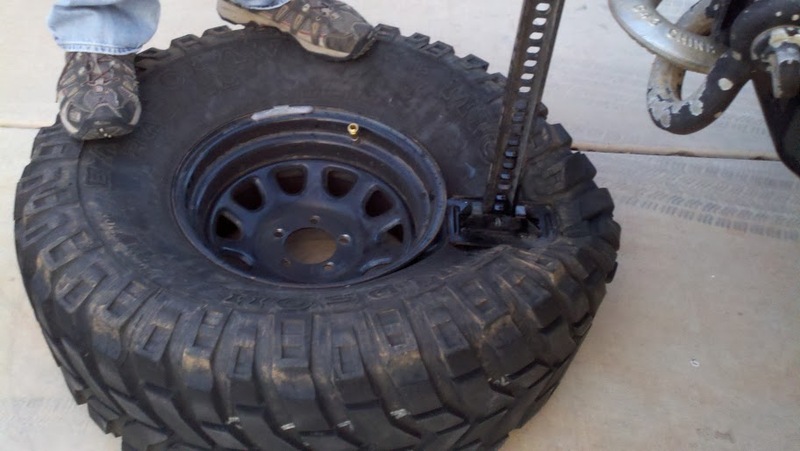 Tractor tires which are 3-5 times bigger. 3. With an air line clamped on and pumping air. When it goes, it usually is more violent whoosh than what I see in your video and blows the flame out itself. 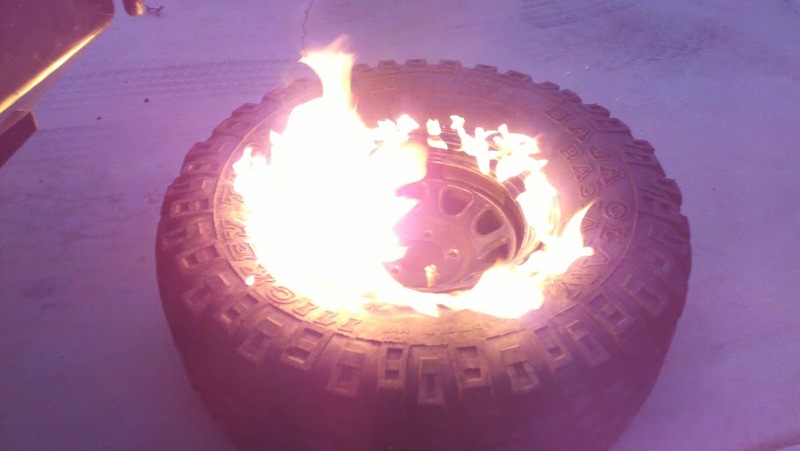 Get too much starter fluid in there and your tire will/can explode. I think tire shops have "cage" setups for reseating tires.